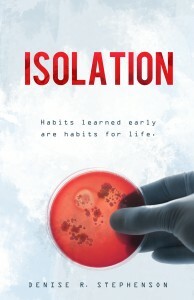 Isolation depicts a bleak but recognizable future in which the fear of contagion reaches a fever pitch as a bacterial epidemic catapults the US into an apocalyptic crisis. Touch is outlawed. Mothers like Maggie bind their infants’ hands, terrified they might slip fingers into mouths. Gary, a Sterilizer, uses robots to scour the infected, avoiding all contact with human flesh. Trevor, the Chief Enforcer, watches, eager to report any and all infractions. One inadvertent touch will change all of their lives. 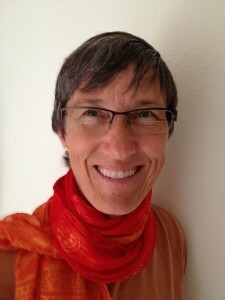 DENISE R. STEPHENSON resides in Oceanside, CA, but she has lived in all the isolated locales of this novel at one time or another. Her publishing history is primarily academic, though as a member of Attention Deficit Drama, she has written and produced monologs and short plays. This is her first novel. My theatre company, Attention Deficit Drama (ADD), was working on a show we called “A Million Monologs for the Millennium.” One of our trio suggested that I write some of the monologs. I said I might, but I doubted it. A few days later I awoke with a monolog in my head which poured out of me whole cloth, no revision needed. That moment changed my writing from self-directed to audience-focused. I wrote three monologs for that show, one for a girl chased by boys, “Squish,” one for a middle-aged hippie, “Hot Water,” and one for an old woman in a holler in West Virginia, “Rockin’.” The old woman has since appeared in a creative non-fiction piece called “Middle of Nowhere,”and she is in my novel Isolation. Inspiration is unpredictable—that’s its joy and curse. When I hear the voices, or a line repeats in my head, I try to be attentive and sit down to capture it. If I get the gist, I can then come back and follow the thread, but if I imagine it’s so good I’ll hold onto it and don’t write it down, it will likely disappear never to be heard from again. The germs of my novel Isolation came from the fear of a swine flu epidemic in the fall of 2009, the CDC changing our behavior by teaching us to sleeve the sneeze, my concerns about the overuse of 99% bacterial killing soaps and sanitizers, and a line that came into my head: “laying a finger aside of his nose.” Then the gift of a sabbatical in the Spring of 2012 gave me the time to create a dystopian world torn apart, not by a virus, but by a variety of bacteria no longer within medical control. I call myself an organic writer, meaning I don’t outline, but rather, allow a story to grow organically from the seed of an idea or the voice of a character. Typically I have no idea where a story is going and am almost always surprised by the ending. But I feel I have a talent for endings, much more than beginnings which I have to work and rework to find the right starting place for readers. Endings, on the other hand, tend to just show up one day and often teach me something about themes in the work that I didn’t consciously know I was working with. My favorite scene is probably the closing scene both because of how surprisingly it appeared for me and because I find it satisfying. If I said anymore, it would be a spoiler. It used to be computer games. I used them to get past fear of the blank page. That was in graduate school, and I no longer need that trick. But if I am resisting writing, I often go to a library or café to change my environment into a space where I’ve had success before. It needn’t be my local library or favorite coffee house; there’s just something about the buzz of people and yet the anonymity that make such spaces work for me. 7. What is your usual writing routine? No routine. But I do have an unusual process I use repeatedly. Some readers might be interested in my blog Cutting Out Fish which describes how I write vignettes and intercut them. Most writers seem to think it an odd process when I talk with them. 8. What is the highest goal that you desire to meet as an author? I hope my readers are drawn in. When readers say they stayed up all night or that they were savoring the book so much they rationed their reading, I’m excited. When they ask for another book, I’m delighted and terrified; delighted by their desire and terrified that the inspiration will never come again. 9. Tell us three fun facts about yourself. I gave up my car for four months last year so I could use the payment money to buy an electric bike, which allows me to go up the many hills along the coast. I love flights of wine, especially reds. I gave up cable a year ago and am incredibly happy about it. 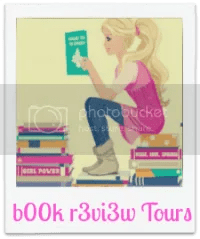 As a first-time novelist I’m eager to find and talk to readers. I’d be thrilled to answer questions from readers who want to know more about particular aspects of Isolation or my writing process. Thanks, Elizabeth. The interview and accompanying material looks great! Thanks for taking part in the tour and hosting Denise!! That is an amazing premise! I’m adding this to my wishlist, thanks for the heads up!